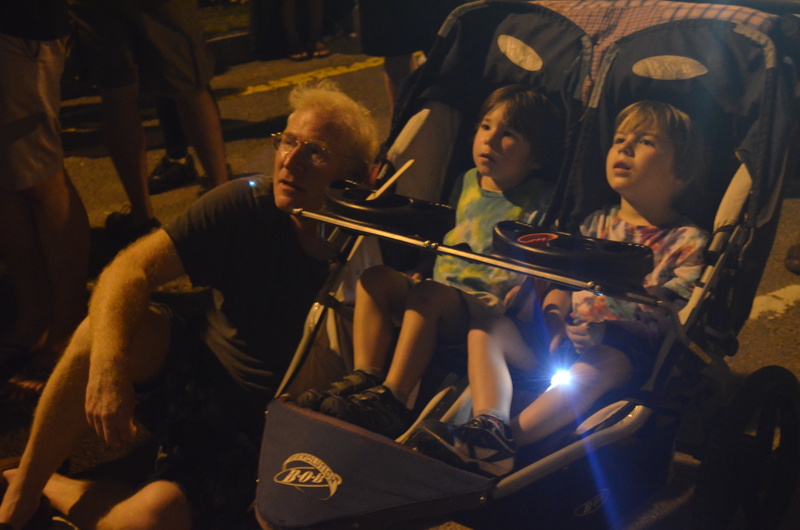 Cambridge, Mass – I know that people take small children to watch the fireworks, because I have seen them there. I admire these people, I really do. I always wanted to be the kind of parent who keeps on doing what they want to be doing, and just brings the kids along for the ride (that whole “strap the kid on the back, and off we go” fantasy). Sometimes I can do it, but with fireworks, I could never imagine how that outing could possibly NOT end in disaster. I still remember a story I heard from our neighbors, long before we had children of our own. They decided to take their two small boys to watch the fireworks. The smaller one fell asleep. When the fireworks started, he was scared awake. He was afraid of the noise and started freaking out, to the point that the parents decided they had to abort mission and leave early, causing the older child to throw a fit in protest. End result: two screaming kids, nobody sees the fireworks, bitter 4th of July memories for at least a year. 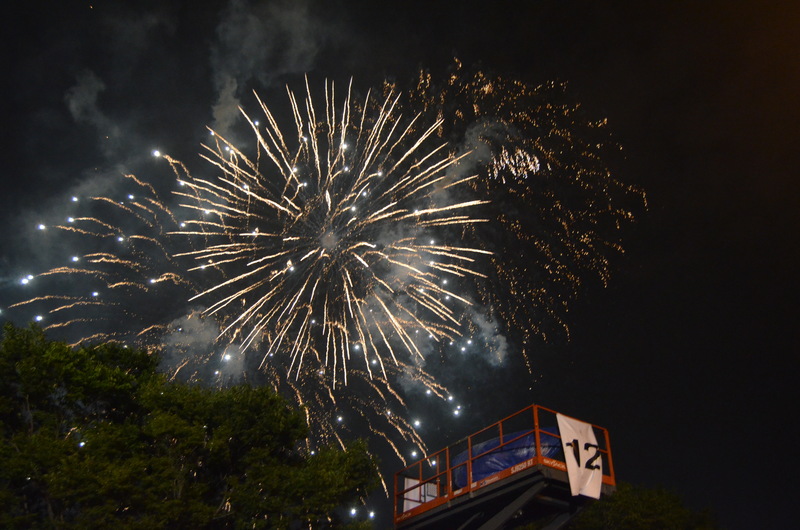 This story stuck with me, and I was never tempted to take my kids to see the fireworks. Not even a little bit. Well, they are four years old now. When they nap in the afternoon (rarely), they can easily stay up until 10pm with no horrible consequences. In Moscow, we watched the Victory Day fireworks (in the distance) from our apartment, and they were into it. After consultation with Daddio, we decided to go for it. In case you have not heard, the 4th of July in Boston is a BIG deal. If you want to do the whole thing–with the Boston Pops playing on the Esplanade and everything–you have to spend the whole day there (fun when you are 20, but not so much when you are 40). But here’s a little secret. The fireworks go off over the Charles River. On the south side of the river, there’s a little town called Cambridge, Mass, and you can see the fireworks from there too. They even set up speakers so you can hear the concert. And if you live in Somerville, you can just walk right down to the river, 30 minutes before the show starts, and enjoy a fabulous, practically unimpeded view. Shh, don’t tell anyone. So that’s what we decided to do. We invited our friends over for a cookout. We filled up the kiddie pool. We bought some beer. We were ready for some good, old-fashioned 4th of July fun. Then somebody figured out that there was going to be a hurricane on that day. I was initially annoyed, and then impressed, that they just up and rescheduled the entire event for July 3rd. Just like that… businesses sent their people home early, roads and bridges closed, traffic was rerouted, the stage was set, the dress rehearsal became the performance. The show was on! For our part, Daddio and I had to reschedule our cookout. Like I said, I was annoyed, but if the City of Boston could do it, so could I. After that, our plan went like clockwork. The twins, miraculously, took good long naps in the afternoon. Our guests, who had been driving up and down the East Coast and visiting colleges for 48 hours straight, still arrived fresh-faced and ready to celebrate America’s birthday one day early. The children played in the pool, the teenagers entertained them, and the grown-ups ate cheeseburgers and drank local beer. And at the appointed time, we loaded the twins into the stroller for the walk down to the riverfront. The fireworks started when we were about three blocks away from our destination. It was 20 minutes early, which seemed like a dirty trick. But we could sort of watch them while we walked. And we finally made it down to Memorial Drive. It was not quite a front-row seat (especially since we had to stand) but it was a great view. The boys–who did start to get sleepy on the walk down–were revived when the show started. In fact, they were in awe. It was, truly, better than expected. Afterwards, there was a strange announcement about the state police ordering an evacuation. We didn’t think too much about it, but gradually started strolling across the MIT campus and back toward home. That’s when it started… like something out of a horror film, we heard the screaming and saw the people running before we actually felt the rain, which came like a giant, high-pressure shower, turned on full blast. We draped a blanket over the stroller and the twins were actually mostly dry. But the rest of us were soaked–just 100% wet–within 30 seconds. And then it stopped. Just as fast as it started, the rain stopped, and people were left standing there, wringing out their shirts. This is something I have experienced in the tropics–a five-minute torrential downpour–but in Boston…? This is not exactly the rainforest. But anyway, we resumed our walk. The twins drifted off to sleep. The rest of us dripped home. It was a lovely evening, really. And a perfect memory for the twins’ first fireworks.